"Katyn Forest Massacre- photos of Katyn memorials"
This section is set up for displaying photos of Katyn memorials other people have sent me, and information about Katyn memorials. To reduce loading times and associated problems I have started to set up pages of images which branch off from this one. This page will still have a brief description of all the images available, including tags to take you to them. 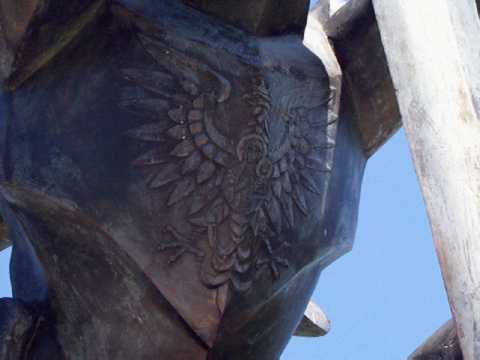 If you have photos of Katyn memorials, or related material, which you are willing to see posted here, with appropriate acknowledgements, please email me with the details and we will see if we can work out the details of how they could be added to this page. In some cases I may find it necessary to reduce the images sent to me or change their format so I can display them, so please do not hold the suppliers of the images responsible for how they may appear on your screen. The copyright of these images remains the property of the suppliers of the material posted on this site as listed with their material. Please contact them directly if you wish reproduce these images. Yes, we do have Katyn memorials in New Zealand. 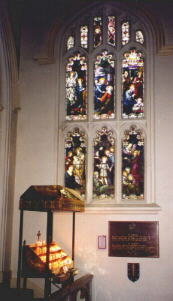 The memorial shown below is in Wellington, in one of the Catholic churches in the center of the city. 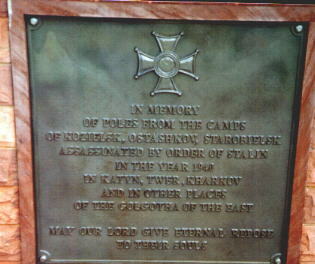 For a wide range of Katyn related photos and graphics try this very good Russian language Katyn site. For example, there is a copy on that site of the original Stalin order to shoot the Poles. Russian Katyn site by Alexey Pamyatnykh and Sergey Romanov. Katyn related articles, original documents, photos, videos and refutation of Stalinist "revisionism". 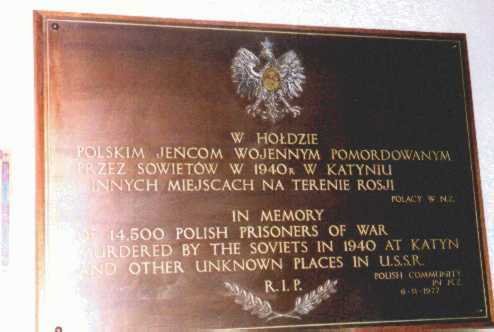 Photos of Katyn, Miednoje, and Ostaszkow, kindly sent to me from Poland by Iwona Sulkowska." 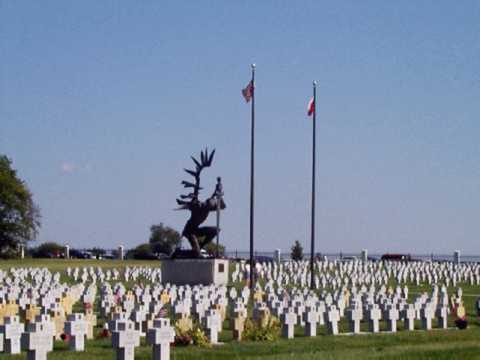 Photos of the Polish memorial complex at Mednoye/Ymok. Plus photos of a Russian memorial to Soviet represssion. Katyn 1940, Wystawa na pl. sw. Idziego, Krakow- kwiecien 2007. A Katyn exhibition near Wawel Castle, Krakow. April 2007. Darcy and Bruce's photos of the Katyn exhibition. 1943 Nazi photos of exhumations in Katyn Forest. Photos of the first Katyn memorial in the world, from Andrzej Kuras, London. Photos of Canada's Toronto Katyn memorial, from Andrzej Kuras, London. Janusz Krasicki's Katyn memorial photographs. Dale Kornfeld's four Katyn Medallion images. Photos of the City of Jersey City Katyn Memorial taken by G.O'Hara. Photos of the City of Jersey memorial taken by Michael Hayward, 4 September 2002. Photos of the Katyn Memorial in Adelaide, Australia. Józef Slawinski's Katyn Memorial, 1980, hammered copper, Entrance Lobby, City Hall, Buffalo, NY. Photos of the Katyn memorial stone at the Church of Johannes in Stockholm, from Roland de Thorey. Photos of the Katyn memorial at Cannock Chase, Staffordshire [UK], from Stephen Mills. 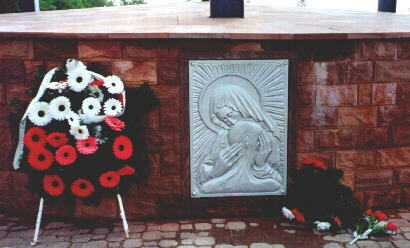 Photos of the 1998 Kharkov Memorial service. Photos of the Katyn memorial in Johannesburg kindly sent to me by Martin Urry. 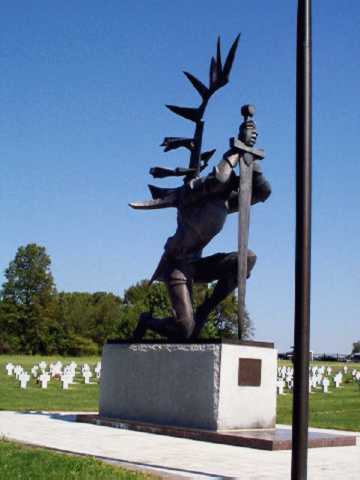 Tom Jemski's photograph of the Katyn Memorial in Baltimore, Maryland, USA. 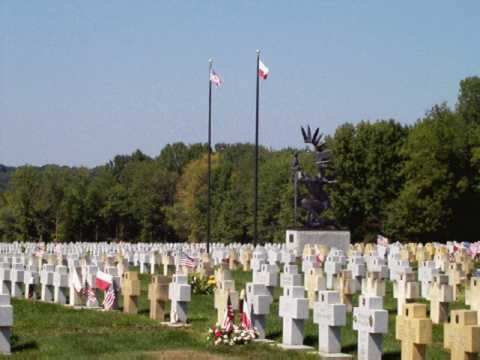 You Tube videos of the Katyn Monument at St.Adalbert Cemetery, Niles,Illinois, USA. 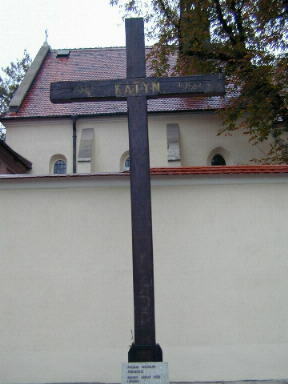 Wojciech Seweryn's monument to the Katyn Massacre. Up loaded by Schmutzle. ©2001 Hank Mishkoff. All rights reserved. Used with permission. A larger version originally appeared on My Visit to Poland website. The Katyn memorial at the Sikorski Polish Club, Glasgow, Scotland. 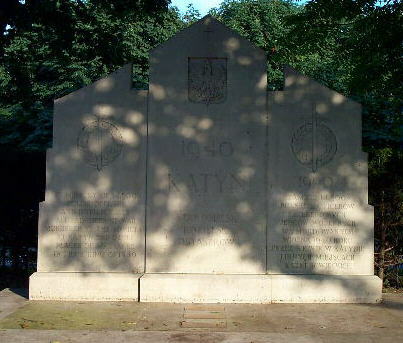 The Katyn memorial at the Southern Cemetery, Manchester. Sent to me by Stefan Kloczko and Marek Zurawski. The memorial was the initiative of the local Polish community - who not only funded it but also had to go to great lengths to persuade the local town council authorities to grant it the required planning permission. 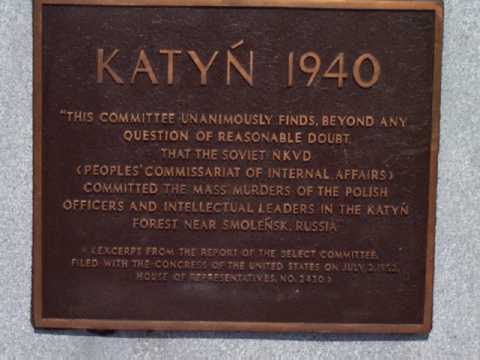 This committee unanimously finds beyond any question of reasonable doubt that the Soviet NKVD (People's commissariat of internal affairs) committed the mass murders of the Polish officers and intellectual leaders in the Katyn Forest near Smolensk, Russia. 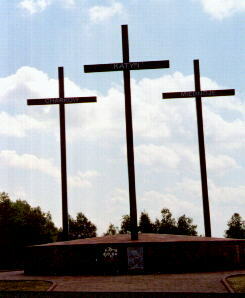 From Stanislaw Dawbrowski, taken during his 1999 trip to the monument in Swietokrzyskie Mountains -central Poland. 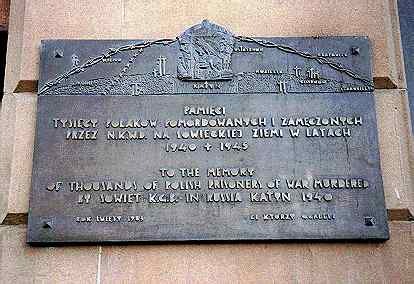 In memory of the Poles from the camps of Kozielsk, Ostashkov, Starobielsk assassinated by order of Stalin in the year 1940 in Katyn, Twer, Kharkov and in other places of the Golgotha of the east. May our Lord give eternal repose to their souls.